Drive By Press is a 100% mobile printmaking studio. 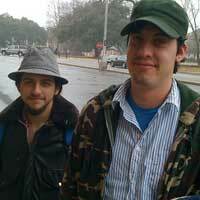 Artists Gregory Nanney and Steven Prochyra brought snow to Alabama in this February 12, 2010. Music is Coming No Home by Arterial Blood Gases.